Britain's climate can sometimes prove troublesome for gardeners and vegetable growers. Frost in particular is the bane of many a gardener's life, as one night of hard frost in spring can prove fatal for seedlings and non-hardy plants. Although plants can be 'hardened off' during spring, unexpected frosts can spell disaster late into May. Likewise, strong winds and excessively damp conditions can cause irreversible damage. During this time, it's a good idea to keep tender young plants and seedlings under some sort of protective cover. 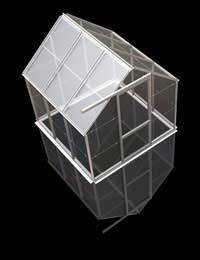 Whilst you could spend money on heating your greenhouse, cloches and other 'mini greenhouses' allow you to protect smaller areas of ground and individual plants without expending any extra energy consumption. They also have the added benefit of being portable; so can be reused countless times as required. A cloche or mini greenhouse will also allow you to plant out earlier in the year, extending the traditional growing season. The extra cover traps heat, which in turn warms up the soil creating perfect conditions for seed germination. Frozen soil is as much a threat to young plants as a hard air frost, so for plants that need direct sowing into the soil, a cloche is a necessity. There are many commercial cloches and protective plant covers available. Thermal fleece, small polythene polytunnels and Victorian-style plastic or glass bell jars are just some of the examples of popular outdoor plant protectors. So why make your own? Cost is one factor to take into consideration. Many of the commercial cloches and mini greenhouses are expensive, especially where aesthetically-pleasing design is a major consideration. Another factor to consider is the environmental cost of producing new cloches. As with most consumer products, sourcing the raw materials and manufacturing the cloches will undoubtedly contribute to global warming. Many commercial cloches will also be made from non-recyclable materials that could take hundreds of years to break down. If you're frugally minded, then perhaps the relative low cost of making your own cloche is appealing. In both cases, using recycled materials is beneficial in terms of financial and environmental cost, and certainly a viable alternative to buying new. There are many different ways to make your own cloche. The type of cloche you opt for will most likely be dictated by what size cloche you're after, and whether you want to spend money on new materials. A very cheap and easy way to make an individual cloche or mini greenhouse for small plants is to reuse old CD covers. All you need to do is locate 4 old plastic CD cases (doesn't matter if they're slightly cracked) and remove the clear plastic fronts from three of the cases. You'll then need to stick the three case fronts together to start making a cube. The CD case that has been left in tact will then form the rest of the cube, with the part where the CD is held forming the lid. The lid can be lifted to provide ventilation or shut to keep in heat as needed. Another very cheap and easy option is to re-use empty plastic drinks bottles. The bigger the bottle, the better! Simply cut the plastic bottle in half, and using the bottom end as a mini cloche. You can punch a few small holes in the top to allow for ventilation if you haven't time to keep moving the bottle cloche on and off the plant as required. The leftover top end (with the bottle neck) can be kept and used as a watering device. When placed upside down in the ground, water can be poured in and channeled more directly to the plant's roots. One of the most common cloche shapes is the half-moon tunnel shape. Any flexible pipes can be used to create this shape, such as thick wire, reused metal hangers or recycled plastic water overflow piping. All you need to do is a make a series of curves (or 'hoops') secured firmly in the ground, and cover with polythene sheeting or thermal fleece. Similarly, you can make a diagonal cross shape, and secure into the ground before covering with polythene or fleece. Make sure that no plants will touch the sides, as they can become frostbitten. The ends of the cover should be gathered together and staked down. On hot days the ends should be opened or the cloche removed completely to allow for ventilation. A quick and easy homemade cloche can be made using round hanging basket frames. These can be bought cheaply at garden centres and DIY stores, or if you have a few old hanging baskets to hand, even better. Only the frame is needed, so you can discard any lining to the basket. Then simply cover the frame with glazing film, securing around the basket rim with double sided tape. Make sure that you leave around 2-3inches of excess before blowdrying the glazing film. This should tighten the plastic around the wire frame. Before long you'll have a perfectly usable homemade cloche.